At least once every three years, sometimes more often, the union and the school district sit down to negotiate the terms for working in the district. CTA has more than 1,000 chapters across the state, and educators in each chapter bargain a contract defining the issues for all members of the bargaining unit: teachers, librarians, counselors, and all certificated staff. On Sept. 22, 1975, then-Gov. Jerry Brown signed CTA-sponsored Senate Bill 160 by state Sen. Al Rodda, known as the Educational Employment Relations Act or the Rodda Act, to give California public school teachers collective bargaining rights. The legislation established an administrative body that became the Public Employment Relations Board (PERB). Disputes over labor law are settled by filing an “unfair labor practice” charge with PERB. Disputes over sections of a labor contract are settled by filing grievances against the school district. Once a union contract settlement is reached, it must be ratified by a majority vote of a chapter’s members, and then by the school board. When the contract expires, the process begins again. If a state mediator cannot help break any bargaining impasse that occurs, and a non-binding report from a neutral fact-finder fails to resolve the crisis, only then can teachers strike. Not everything is negotiable. Critical job issues that are within the legal scope of bargaining include compensation, hours of work, safety matters, class size, evaluation and disciplinary procedures, health care, access to personnel files, preparation time, seniority, transfer rights, a grievance procedure with binding arbitration to settle major disputes, discrimination, job assignments, and early retirement. Issues not within the scope of bargaining include a district’s staffing needs, the district budget process, matters affecting employees outside the bargaining unit, the timing of layoffs, an advisory committee formed by the employer, and access to information unrelated to union representation. Bargaining law levels the playing field. Teachers sit down as equals with administrators and both sides start the process with initial proposals. Even without today’s harsh economic climate, where many California school districts hit with cuts are trying to reduce health care benefits and salaries and impose furloughs or worse, the bargaining process has shown that teachers are willing to push back to protect their profession and their compensation. 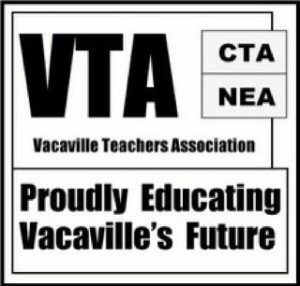 Our bargaining team consists of the following VTA members and they may be reached by VUSD email or by clicking their names. Bargaining updates for this current session may be found here.